Baked vegan chocolate pistachio doughnuts dipped in chocolate ganache and topped with crushed pistachios for the perfect morning pastry. My last job as a baker included a weekly 4:30 am shift. For most bakers this might be considered sleeping in but somehow over the many years and many jobs I had in pastry this was the earliest I’d ever been awake for work. At 4:30 I would head into the silent dark bakery, turn on all the lights, start up all the ovens, and get the morning’s pastries baked off. There is something really wonderful about waking up with the preheating oven and breathing in the solitude of an empty store that was, only hours ago, busy with people finishing their shopping and employees rushing around trying to get home before midnight. And as crazy as it sounds I would love to trade some of my mornings of waking up to a crying toddler (albeit several hours later) in for a few early morning baking shifts. We sold chocolate and vanilla vegan donuts and most mornings, as soon as they came out of the oven, I would sneak a warm and perfectly crispy yet moist donut into my belly. The knowledge of that morning donut certainly helped me get out of bed when my alarm went off at 3:45 am on those days. Now every other week Jason goes downtown to a meeting and stops in at my old stomping grounds to buy me one of those amazing chocolate donuts. But as I’ve (finally) arrived into my third trimester of pregnancy and am rediscovering the aches and pains, the sleepless nights, and the general feeling of, well, pregnancy, I’ve decided one donut every other week might not be enough to get me through. Preheat the oven to 350 degrees Fahrenheit. Lightly spray a donut pan and set aside. In a medium bowl combine flour, sugar, cocoa powder, baking powder, baking soda, and salt. In a separate bowl whisk together apple sauce, soymilk, oil, and vanilla. Add wet ingredients to the dry ingredients and stir until just combined. Spoon or pipe batter into donut pan and bake for 12-15 minutes until donuts spring back when pressed. Remove from oven and let cool slightly before transferring onto a cooling rack to cool completely. To make the chocolate ganache place chocolate chips in a small bowl. Heat soymilk until just before boil (a thin layer of skin will form on the top of milk when ready). Pour over chocolate chips. Cover for 5 minutes then stir together until chocolate has completely melted and ganache is well combined. Dip the top of each donut into the chocolate ganache. Let set up slightly (about 5 minutes) before dipping donuts into crushed pistachios. Let ganache set up completely before serving. Hi! Love your site and I’ve made several of your recipes. I’m going to try these doughnuts for my son’s birthday breakfast surprise. Wondering if I can sub coconut oil for the canola oil? I usually do in baking recipes, but I’ve never made doughnuts before so I wasn’t sure. Thanks! You could try chickpea flour or any other fruit puree that doesn’t have a strong taste. Check out my guide here for some ideas. Lovely recipe, but very cake-ish; I think my husband said he’d prefer a more donut-like density. Any adjustments we could make to achieve this? Thanks so much for the recipes! So from your experience, are cake donuts just normal cake in donut pans? I made them today, but they turned out a bit dense and not spongy. I stirred the wet ingredients into the dry ingredients until just combined as indicated, but perhaps I should mix them more throughly? Thanks. They are supposed to be cake-like in texture. If yours were too dense, you could try and add a little less liquid. You don’t want to mix them more than you have to because that makes the finished product tough. One doesnt get applesauce where i live. What can i use instead of it? Eggs? I am just dairy free, not vegan! I just made these yesterday, but I substituted Betty Crocker’s Gluten Free All Purpose flour. I had read that if you let GF batter rest at room temperature the grainy/gritty/chalky texture will go away. It worked! I also used almond milk instead of soy milk. I also used a mini bundt pan filled halfway in each section since I didn’t have a donut pan (I made four). The end result was phenomenal. They are light and moist a day later. I made these for my boss who is gluten free, dairy free, and egg free for a huge meeting with our CEO and her boss. The CEO and her boss were really impressed with how gorgeous and tasty they looked (they looked just as good as the fancy donuts I bought the rest of the group) and my boss really enjoyed eating one. Awesome Libby! thanks for taking the time to share with me, I love when my recipes are enjoyed by many! And thanks for sharing your GF tips too, I know many of my readers will appreciate that. P.S – Wonderful photos on your site! 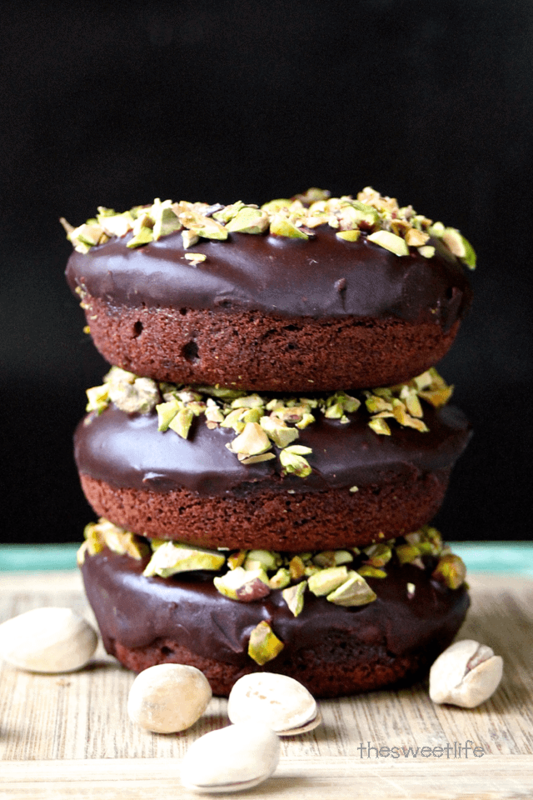 I’m a huge fan of these salty pistachios, but I’ve never had them on these chocolate glazed donuts! I’m so in! And beautiful shots! Thanks Rika! They sweet and salty combo is the best! where does one find a donut pan? i have whoopie pans will that work? would love to do these for halloween party!! Also most kitchen stores and department stores would carry them. I’m not sure what a whoopie pan looks like, but I suppose it would make domes that you could cut holes out of the middle of. I personally think a donut pan is an EXCELLENT things to put 10 dollars towards.